A total of three companies have been invited to tender for the Gourock and Dunoon ferry service, the transport minister has said. 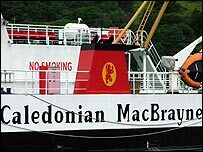 Tavish Scott said Caledonian MacBrayne, V Ships and Western Ferries should submit their ideas for taking over the route. It will carry both vehicles and foot passengers between Inverclyde and the Cowal peninsula. Mr Scott said the service was a "vital lifeline" for locals and tourists. CalMac currently operates vehicle and passenger services from Dunoon pier to Gourock pier and Western Ferries operates a similar service from Hunter's Quay to McInroy's Point. The statutory requirements of the new service include a minimum of one return sailing per hour and it must operate between Gourock Pier and Dunoon Pier. Mr Scott said he was pleased to have moved to the next stage of the tendering process, adding: "The Gourock-Dunoon ferry service is a vital lifeline for both local people and visitors to the area. "I would encourage the three companies invited to tender to come forward with their ideas for taking over the running of an efficient and reliable service between Inverclyde and the Cowal peninsula, that meets local people's transport needs." The route is being offered as a commercial service with no subsidy and the removal of the current operating and timetable restrictions.